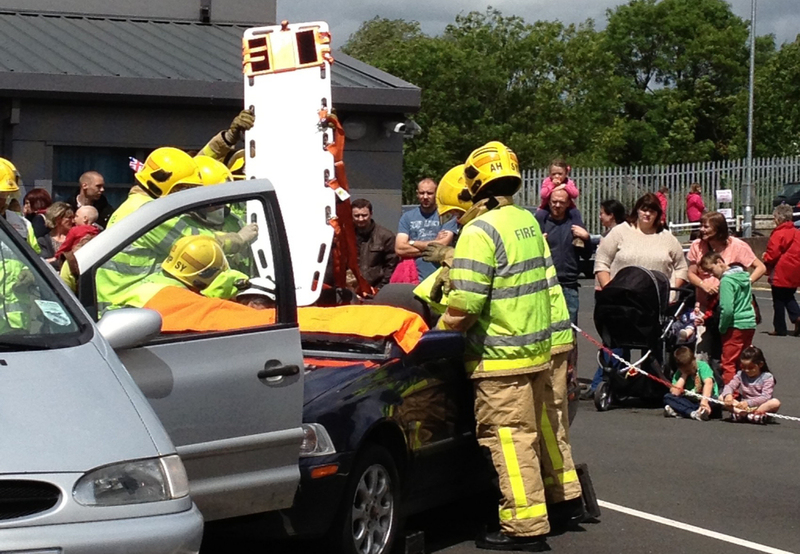 A fun packed open day is forecast at Shrewsbury Fire Station on Saturday, August 18 with a host of activities for all the family. Practical demonstrations of firefighter skills and equipment will show how they rescue people in emergencies alongside advice for the public to prevent house fires. Special fire appliances and rescue equipment will be at the open day at the St Michael Street station during the open day which runs from 10am until 4pm. Flames will soar from a chip pan in a fire safety demonstration, firefighters will rise 32 metres skyward on the Aerial Ladder Platform, and there will be two simulated rescues from crashed cars with firefighters using cutting equipment to free the drivers. Visitors will get the chance to see the “smoke house” where firefighters are trained to carry out rescues wearing breathing apparatus. A smoke tent will reveal how important it is for members of the public to have their own fire plan for their home, the importance of smoke alarms on each floor and show how to prevent fires. A team from the Midland Cave Rescue will carry out a rope rescue and show how they also save lives. British Red Cross volunteers who help victims in the immediate aftermath of a house fire will also be at the open day. Visitors can also talk to the motorcycle couriers from Blood Bikes, which are stored at Shrewsbury Fire Station, and used to quickly transport blood and other emergency medical items in an emergency. Watch Manager Neil Maguire, who is one of the organising team, said: “It really is an action packed event and promises also to be a fun day for everyone. We’ve also got some Star Wars characters in costume and Batman along with a playbus for children. Shropshire Live has been providing Shropshire with independent news and entertainment since 2009. Send us your news to interact@shropshirelive.com or call 01743 818 095. For advertising information call Fiona on 01743 816 817. Two amazing festivals are heading to Weston Park this May, find out more and enter our competition to win a VIP Family Pass to both events. It is busy time across Shropshire this Easter with plenty of events and activities across the county. Take a look at some of the events near you. Three people have been arrested after a Ford Transit van was stolen from a delivery driver in Church Stretton and recovered by police. The RSPCA received more than 120 calls about exotic animals last year in Shropshire, new figures show. A former county High Sheriff has been appointed president of the society behind Shrewsbury’s successful flower show. The Wrekin Housing Trust has celebrated its partnership with the Telford Tennis Centre by awarding prizes to league winners. Sixty-one teams – two more than last year - from 29 clubs are competing in five divisions of the Shrewsbury and District Senior Citizens Bowling League this season. Ten-man Oxford United produce a surprising comeback to take all three points against Shrewsbury Town. Telford-based digital manufacturer Protolabs has scooped a prestigious Queen’s Award for International Trade. Connexis Limited has welcomed Joe Hill to the team as a full time engineer after he successfully completed his apprenticeship. Shropshire Youth Support Trust charity and members of its ASYSTORS Panel are celebrating the launch of a brand-new lifestyle eating enterprise in Telford. Runners from across Shropshire will be taking part in this Sunday's London Marathon. David Dickinson and his team from ITV's hit antiques show, Dickinson's Real Deal, will be heading to Telford on Saturday 27 April. A Shrewsbury care home will be playing host to a scheme launched by Shrewsbury Town in the Community to bring older adults together through a range of activities. West Felton, near Oswestry, has planned a Carnival Day fun-packed with entertainment on Sunday 14 July 2019. A new carving workshop will feature at this year’s Newport Show for the first time, organisers have revealed. A new beer created to raise funds to protect one of the West Midlands rarest butterflies has been launched by a Shropshire brewery. A Vineyard on Shropshire border has launched a new special edition Award Winning Red wine. One of Shrewsbury’s most historic and longest serving fine dining restaurants is aiming to become the town’s go-to venue for casual dining. For general enquiries, including sending us press releases, email interact@shropshirelive.com or call 01743 818 095. Find out how to make a complaint about Shropshire Live content by clicking here. Shropshire Live is regulated by IMPRESS: The Independent Monitor for the Press CIC. Shropshire Live has been providing Shropshire news and entertainment since 2009. We reach over 100,000 readers per month, making us the biggest online-only news publication in the county.